Now that I have the scrapbook bug again, I am revamping my blog, Layout-A-Week. So to kick that project off, I am going to post a video a day in July, starting today, showing how to do a scrapbook page from start to finish. I also realized it has been 3 years since we did a 20 Pages In a Day class — can you believe that?! I had no idea it had been so long. No wonder I am so behind on my scrapping! Are you ready to get some scrapbook pages done? It's hot outside so grab a tall glass of lemonade and sit down inside to scrapbook every day with me! LOL The videos will post daily to my YouTube channel and we'll be sharing the links here and on Layout-A-Week so be sure to follow us in BOTH places and via social media (you know, Facebook and stuff) so you get all the updates. I will also be sharing how to create the pages from our 10 Layouts Kit! So here is today's layout, to kick things off, a page about Katie's Science Fair Project! 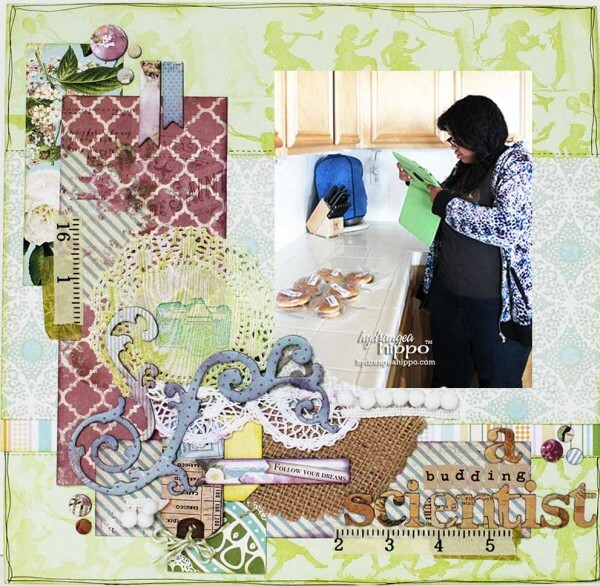 This layout features elements from our “Petals and Pigtails” Kit and our “Vintage Mint” July 2013 Monthly Kit.